The 10th of April marks Socialite, Hamisa Mobetto´s daughter, 4th birthday who is serving baby fashion goals. The Tanzanian model is her baby´s, Fantasy, personal stylist and her taste of style speaks it all. Let´s forget baby Fantasy´s sense of fashion. Let us talk about her 90, ooo+ followers on her Instagram page. How that is possible, only she knows. 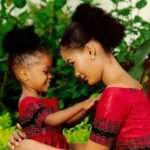 Hamisa Mobetto´s, Baby Fantasy Anyway, the account is run by her mum, who follows Fantasy´s father, Tanzanian media mogul, Majey. Baby Fantasy is definitely well connected, isn´t she? The little one is now all grown and is an exact copyright of the mother starting from her looks, to her sense of style and to the glamour she exudes. The mum is proud to have Fantasy in her life and serves mummy-daughter goals. Hamisa is a mother of two, baby Fantasy and her ex, Diamond´s son, Dylan. Recently, the bongo flava star withdrew upkeep payments for his son with baby mama, Hamisa Mobetto. However, seems Dylan is not doing badly too after the two settled on a monthly fee in the end. Happy Birthday to the stunning baby doll. The post Hamisa Mobetto celebrates her little mermaid as she turns a year older appeared first on Ghafla! Kenya.